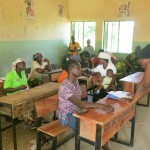 In Lambata Community, Kwaali, Abuja, Peer Educators under the Female Out Of School Sexual Reproductive Health Education (FORSHE) program recently held a community outreach program to inform and educate women in the community on family planning and unsafe abortions. At the forum was Mrs Philomena Daka of the Ijah, Sariki public health centre in Abuja. 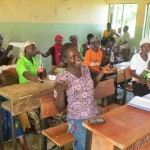 She tutored the women on prevention of unplanned pregnancies through the use of contraceptives such as female condoms, hormonal pills, implants and injections. 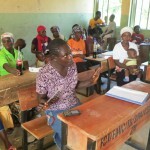 She also advised on family planning methods to ensure healthy development. Child spacing was one such example. To allow for a full recovery of the mother and to increase mental and development growth of the child, Mrs Daka recommended the short term use of methods like hormonal pills and female condoms in between children. Mrs Daka also advised against informal health care services even when young girls are embarrassed or scared of revealing their pregnancies. While the peer health educators supported Mrs Daka’s message to the group they also advocate for the legalization of abortion in Nigeria to reduce the large number of young women lost to unsafe abortions yearly.